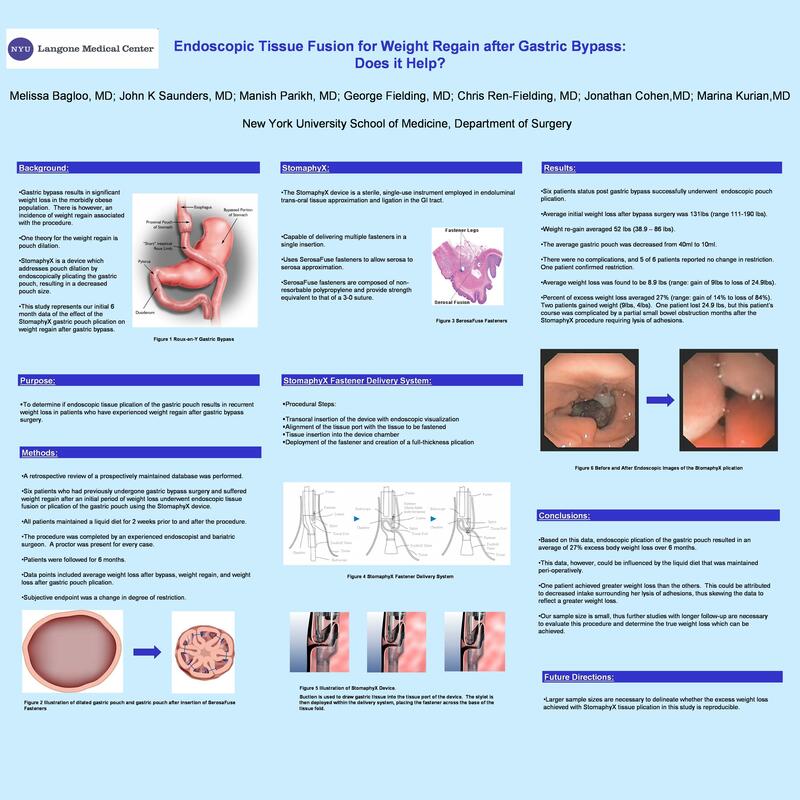 Endoscopic Tissue Fusion for Weight Regain After Gastric Bypass: Does It Help? Background: Gastric bypass results in significant weight loss in the morbidly obese population. There is however, an incidence of weight regain associated with the procedure. One theory for the weight regain is pouch dilation. StomaphyX is a device which addresses pouch dilation by endoscopically plicating the gastric pouch, resulting in a decreased pouch size. This study represents our initial 6 month data of the effect of the StomaphyX gastric pouch plication on weight regain after gastric bypass. Methods: A retrospective review of a prospectively maintained database was performed. Six patients who had previously undergone gastric bypass surgery and suffered weight regain after an initial period of weight loss underwent endoscopic tissue fusion or plication of the gastric pouch using the StomaphyX device. All patients maintained a liquid diet for 2 weeks prior to and after the procedure. The procedure was completed by an experienced endoscopist and bariatric surgeon. A proctor was present for every case. Patients were followed for 6 months. Data points included average weight loss after bypass, weight regain, and weight loss after gastric pouch plication. Subjective endpoint was a change in degree of restriction. Results: Six patients status post gastric bypass successfully underwent endoscopic pouch plication. Average initial weight loss after bypass surgery was 131lbs (range 111-190 lbs). Weight re-gain averaged 52 lbs (38.9 – 86 lbs). The average gastric pouch was decreased from 40ml to 10ml. There were no complications, and 5 of 6 patients reported no change in restriction. One patient confirmed restriction. Average weight loss was found to be 8.9 lbs (range: gain of 9lbs to loss of 24.9lbs). Percent of excess weight loss averaged 27% (range: gain of 14% to loss of 84%). Two patients gained weight (9lbs, 4lbs). One patient lost 24.9 lbs, but this patient’s course was complicated by a partial small bowel obstruction months after the StomaphyX procedure requiring lysis of adhesions. Conclusions: Based on this data, endoscopic plication of the gastric pouch resulted in an average of 27% excess body weight loss over 6 months. This data, however, could be influenced by the liquid diet that was maintained peri-operatively. One patient achieved greater weight loss than the others. This could be attributed to decreased intake surrounding her lysis of adhesions, thus skewing the data to reflect a greater weight loss. Our sample size is small, thus further studies with longer follow-up are necessary to evaluate the efficacy of this procedure in increasing weight loss.